And now Part 4 of the Annihilation Chronicles is up. On Gauntlet's suggestion, I've also broken up all the chapters into multiple pages, so they're easier to read in more than one sitting. Turns out that despite my best efforts to be concise, every chronicle ranges 20-40 pages in Word, and my tendency to avoid making extraneous pages made for some ridiculously long chunks of text. Hopefully now the stories will be a little more accessible to you. Besides that, check the Gallery for some new pics from Crys and myself. Part 3 of the Annihilation Chronicles is up. That's all for now. Coming at you live from the Mech's Meet where I can apparently make updates even on the road. It helps that I finished these two walkthrough pages before leaving and just needed to uncheck a box over here on the other side of the country. So today is the last two walkthrough pages that were stinking up the index page with their lack of linkage. Maps and Virus Breeder. Now I could probably say the walkthrough is finally complete, but there are a few more tasks to complete in the existing pages before that. At least now the links are all there so it looks complete to the naked eye. Okay, so what's been going on the last six months? Well, not much here, evidently! I went back to school for a bit January to March, focused on projects for the Maniacs' 10th Anniversary April to May, and then kinda pissed away June on video games, only recently getting back to being productive for July. The primary result tonight is the Walkthrough's Miscellaneous section, containing lots of tables of boring data on what you can buy at shops, where to find all the power-ups, and stuff like that. There are also some weird obscure things thrown in at the bottom, like an explanation for the above image. That just leaves the Virus Breeding and Maps pages now. Looking back in the archives, it looks like it's been almost exactly a year since I said I had all this data waiting to be formatted and that it wouldn't take much longer. So much for that. Speaking of archives, Gauntlet's been bugging me to get all the AXE updates reconciled with the main blog (okay, so he asked me one time and I ignored it for a few months), and I finally got around to it just now, so AXE updates are archived in the blog. Does it matter? I dunno. G seems to think so. Story updates ought to be coming soon as well. And this is "soon" as in a week or two, being wrapped up right now, not "soon" like 2011. Honest. Happy New Year. I had hoped this update could still make it in for December, but it was considerably more work than I expected. Par for the course as it would seem. The big new page this time is the EXE3 Walkthrough's Virus Guide. Like the NaviCust and StyleChange guides last month, I put much more research and effort into this page than was really warranted, but it's complete, and that's what I was aiming for. Also check out Crys' gallery for a New Year's pic. And speaking of the new year, that means it's time to archive the old updates again. Probably the last update of the year. The walkthrough now has complete info on EXE3's NaviCust and StyleChange systems. I spent considerable time pulling and testing the data for these sections rather than just copying off of GameFAQs, which turned out to be a good move since I ended up finding a few things the other walkthroughs got wrong or missed. Still no more Inter-Missions yet. Gotta establish more story before we can properly play off of it. Check out my art gallery for a couple new pics based on Crys' characters. That's the only added content for the moment. The main reason for this mini-update is to announce that Akutare has quit as Bubbleman. There will be no recruitment drive to replace him right away, as I'm leaning towards the scaled-down approach - same reason we still don't have a new Bowl or Yamato, I want to make sure I can mobilize a tight group of reliable members rather than continuously take chances on untested new ones. An unsettling impact of my decision not to replace Aku is the blank spot it would naturally leave in the bio navigation bar up there. After weighing the options, I kept the button linking to the Bubbleman bio which now just describes Bubz as an NPC. It's a little off since all the other NPCs are listed on a separate bio page, but it's either this or completely redesign the navbar and I don't think this development is worth the effort. No new Inter-Mission this update. The second installment of the current chronicle storyline is up. There are a couple new pics in Crys' gallery as well. We also have a nice new updated navigation bar up there with rollovers, thanks to our good pal and landlord Gauntlet for the coding work. After the three month gap between updates, I at least put a couple more hours into the artwork for the last-minute InterMission comic. Hopefully that can also make up for it not being that funny, even to the few people that would know what it's referencing. I've been spending the last month and a half finishing up the walkthrough, at least the storyline part. All nine chapters have been finished. There were ten chapters before, but that was just so it would match up with VI's EXE1 walkthrough, which is also numbered wrong. I just combined the "Helping Tora" and the "Plantman" scenarios as originally intended. Now I just need to add supplementary pages for the walkthrough, which shouldn't take much longer. I already have most of the data, just need to organize it. Also updated today are Akutare's and Beastman's art galleries. My embarassing Inter-Mission comic experiment continues below with no discernible improvement, except perhaps in the lettering department. I can scarcely believe it myself, but we did three, count 'em THREE updates this month! Now that's more like it. Check out the art gallery for more stuff from me and Crys, sprites of upgraded Drillman and Beastman's new operator have been added to their respective bios, and Chapter 3 of the EXE3 Walkthrough has gotten its in-depth overhaul (Even if you don't need to read it, be sure to scroll to the end of the page, blub). The big part of the update is once again the Navi Marks section. The biggest change? I'm changing the name from "Navi Icons" to "Navi Marks". This'll be a tough transition for me since I've been in the habit of calling them icons ever since the advent of the series, mainly because I associated them with the similar circular emblems worn by similar cyberspace-dwelling characters in the cgi cartoon Reboot (incidently, I finally got around to making an homage to that show in this very section). I've found not many other EXE fans make the same connection; they're more likely to refer to them as "symbols" or "emblems". I've decided to go with "mark", which is the term Capcom uses, as I only just recently verified from their artbooks. Hopefully this will make it easier for fans to find the section. But we haven't just rebranded the page, we've added a whole heap of NEW ico-er-marks. With the remaining Phantom of Network navis and the non-navi symbols like the Cybeasts and RedSun/BlueMoon, we've finally completed the official part of the project (ehhh, except for the Legend of Network navis like Rideman, Reverse Rideman, and Troy, assuming they don't all have the same mark since they're apparently all the same entity...don't suppose anybody could hook me up with artwork from this horribly underexposed game?). There are also several more additions to the collection of original marks relevant to team canon, some even from members that are not me! And because even that isn't enough, I added a new heading for marks that aren't even EXE related, just for the hell of it. Even with the official navi marks complete down to just one or two missing, the sky is the limit for these simple circles. Oh yeah, the Inter-Mission. Uh, I'm experimenting with it right now. One lesson learned is...well, drawing a comic does not work well in conjunction with my usual "do it at the very last minute" approach to Inter-Missions. That's one thing I need to fix for next time, in that I should probably start on it now, instead of an hour before the next update. There's more new pics of more new characters known as the Children of Vengeance in my gallery, and I made some new sprites for Flamechick's bio. The Icons section got an update, but no new icons yet. Instead I spent some time modifying old icons I found out were originally inaccurate. Sure, they're all inaccurate in the sense I'm giving them 3D lighting and shading effects, but I at least want the shape and colour of the symbol to be as close as possible. In case you're keeping track, these are all the ones I changed: Roll, Proto, Number, Stone, Colour, Fire, Magic, Elec, Shadow, Toad, Gate, Magnet, Heat, Snake, Thunder, Napalm, Flash, Desert, King, Plant, Flame, Mist, Bowl, Punk, Bass, Top, Spark, Wind, Search, Junk, Cold, Kendo, Shade, Laser, Colonel, Tomahawk, Star, Turbo, Ring, Hat, Normal Navi, Netmafia Gospel, and Nebula Syndicate. The rest looked close enough for me. The only one I regretted fixing was Turboman's. I put a lot of work into the original version, working off an image of a real hubcap to get the lighting on the metallic saucer shape juuuust right. At the time, people (who probably had the official icon image on hand but wouldn't show it to me) told me the design was wrong, that it was supposed to look more like a steering wheel than a tire, but I ignored them because I wanted my design to be right after all the effort that went into it (I mostly blame BCC for the confusion. 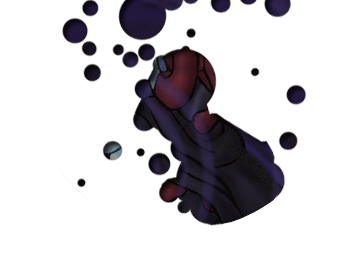 I used the icon from the chip image there and upon recent closer inspection, the three holes that should be black were instead rendered transparent, making them appear brigther than the parts around them, making me think the holes were the metal part and the darker grey part represented the holes). Well today I did make that fix for the more accurate steering wheel shape (or differently shaped hubcap maybe), but I still couldn't part with the inaccurate original, so it was a simple matter to stick it in the Unofficial section and attribute it to some navi called "Tireman". I'll probably never design a Tireman to use the icon, but I'll still keep it on that page. After a long wait, the first chronicle is up. So begins the next Annihilation epic, let's see if we can finish it within the next millenium this time. On top of that, I've whipped up some interesting pictures featuring the current and upcoming characters for the gallery. And would you believe that EXE3 walkthrough has actually gotten some progress? Thanks to Koala, the storyline is complete, albeit looking kind of unfurnished. I feel like the guide still needs a personal touch to excuse its existence when GameFAQs has already done the job many times over with greater depth. I've gone over Chapters 1 and 2 with this in mind, adding greater detail, handy maps, and illustrative screenshots. I'll get to the rest in time, but at least the rest of the chapters are all up now. Well it wasn't "very soon", but here it is. Check out the Fiction section for a couple stories introducing a couple of our new members, and another account touching us up on one of the guys that stuck around. These stories have been finished for a few months, but wouldn't you know it was MY job that kept getting put off for weeks and weeks. I finally brought over the rest of the old site though, which means it's shutting down. If you look around, you may find a few things that are relatively new in the sense they probably should have been on the old site but were instead just sitting unused on my computer for some reason. One such lost and found work is the Battlechip database which can be found under "Data". There's still a lot of unfinished projects laying around and hopefully we'll actually complete them some day. Next update should see the start of the new main storyline, some special artwork to accompany it, and if we're lucky, some other tidbits, and if we're really lucky, it will actually be done within the month. Welcome to the new home of Annihilation. It has been a while since the first season finale, and we have a lot of changes in mind for the continuation of the team. For starters, we changed to a new site. I am also Snakeman on the Mechanical Maniacs, so it didn't take much to get a hosted position here, though as you may notice with the Mechs layout all over the place, it's more of a merger than a hosting situation. Right now it may not look too sharp, but after a while, and with some upcoming work on the MM3 end, the two teams ought to blend together seamlessly, and hopefully so will the layouts. The old AXE site is going to remain open for a little longer, at least until I convert all the old pages and bring them over here. That sounds like something I should have done before making this update, but I felt like planting a firm foot down and letting the audience know where we're at. And what better way to do that than with the quintessential MM team feature...Bios! A lot of work went into fine-tuning these, with each and every member flexing their creative muscles. Reading them can give you some hints about where the plot of the new story is headed. We've kept five of our original members and took on five new ones, leaving four slots out to dry. Just to be clear, I never intend to replace Punk and Serenade. Their status as characters threw off the balance a bit, like a classic series team with Protoman on it. As for Bowl and Yamato, they may return as occupied slots eventually, but for now I'm happy with the group we have. Tight, manageable, and reliable. I'd like to thank everyone that applied though. I turned some of you down, but I'm glad you were interested anyway. It made me realize the team was worth continuing, and I wasn't entirely sure about that at the start. By the way, the Mechanical Maniacs Forum (link in the upper-right corner) will be serving as our board from now on. The old board barely got any activity besides private team planning stuff, and we've had our private board at the Undernet for a while. I don't think we need a whole public board just for our little team, but if you have anything AXE-related to dicuss, don't hesitate to bring it up at the Undernet. With the visual theme of that place, it seems to suit us even better than MM3. Hang on for the next update very soon when we'll have more content from the old site, and some brand-new stories from our eager writers. At the moment, you can also check out the Inter-Missions below. As always, you know the Drill! Here it is, 3.5 years after it was inititally scheduled for, the Season 1 Finale for Annihilation! So things just got slower and slower to the point that 2007 only got two real updates? Well, I did actually do some minor updates back in June, but it seems I forgot to announce them. What I did back then was mostly backing up the site and fixing minor errors. Matt's pics took longer to download than expected. Turns out his filesizes were all nearly five times bigger than they needed to be. No wonder we were running out of space a while back! I went through and cropped, resized, and adjusted them to manageable sizes and even found one pic in the folder that wasn't posted yet. So his whole gallery got a significant update. If you already read the first three finale parts, read them again before Part 4. You've probably forgotten them by now anyway, and a few small changes have been made to them since then. There were some things I was going to add from the start, but forgot about them until a reference in Part 4 reminded me. Yeah, not very professional, sorry. Heck, I'm just glad it's finally done! In March of 2004, Rajal Tikana replaced Vidal as Darkman, and after the annoyance I experienced re-drawing the NG group pic and editing the Chronicles to make it look like Adrienne was there from the start, I decided that we would freeze the roster until the end of the season, a logical time for memberships to change within the story. At the time, I was sure we would finish the season by the end of the year. Well, before the year was through, Havoc, Rajal, and Novaman were all AWOL. The Chronicle schedule got its first huge delay when Cifnas was tagged to write the next one, but he kept coming back with ridiculous excuses as to why he couldn't post it yet. I kept giving him the benefit of the doubt, but eventually I had to give up on him and write it myself. I just wish I'd done that a few months sooner, maybe our momentum wouldn't have been so broken. 2005 was the year where things really started to fall apart. We hit our first big hiatus in July, which lasted until December. Bubble, Flame, Cifnas, Midoriman, and Gemini never really returned after the rest of us got back to work. Already by this point, the roster was reduced to less than half, which would seriously impact productivity for the next two years, but I was determined to keep that roster frozen. After all, we were so close to writing that finale! It wasn't until late 2006 when the finale writing actually started, and multi-month hiatuses continued between every month-long surge of activity. Cyros became the last member to quit in July 2007, leaving the five that are here now. Part 4 started writing in November, and might have actually been completed before the end of the year, except my own writing talents were largely diverted to the Business of War event with the Mechanical Maniacs. So the last hiatus ended a couple months ago. Even though I had four teammates willing to stick around, only one of them was currently up to the task of writing. Two people writing for a 14-member team. Fun. Why didn't I call it quits two or three years ago? Well, I don't like to leave orphaned projects. Besides that, I just really loved the idea of the AXE Finale. I've had much of it planned out in my head ever since early 2005. A lot of the details have changed, but some things made it through almost exactly as I imagined them way back then. Even if things didn't turn out the best, I'm just glad I finally finished what I started. So where does that leave us now? We have five members: Nijubu, Blackbelt, Koala, Beasty, and myself. A couple slots are being permanently retired: Serenade and Punk. We may bring Punk back later on, but Serenade is too special and powerful to be slumming it with the rest of these regular navis. So the characters we will be recruiting for are Flash, Dark, Flame, Metal, Yamato, Bowl, and Bubble. There's no guarantee that we will admit anybody though. At this point I'm more inclined to convert the team to a more private project that the few remaining veterans and I will develop as we see fit. I know there are a couple of you out there eager to join, so I'm sorry if this crushes your hopes. I'll only keep AXE as a full, active team if we get a lot of good applicants to fill the void. If we only get a few people of passing interest, then there's no point. The same thing will happen all over again. Regardless of this team's future, please read and enjoy the Finale. A lot of heart went into it. Any point in denying things are bad around here any more? Nah. Aside from the lack of activity from the remaining team members, I gotta say this "don't change rosters until the finale's over" plan has been a massive failure. Just think how much faster this finale could have been done if we actually replaced the dead weight immediately and got in some eager and active new members? By now interest has dwindled so much I'm not sure we're going to keep on going for a second season. It all depends on our ability to attract new blood. That's not to say the season won't end as planned. Finale Parts 2 and 3 are both up for viewing. Part 2 was done a long time ago, but for some reason I kept putting off the update. One things for sure though, the next time we update (who knows when that'll be) Part 4 will be posted, and Season 1 will be complete. At that point we'll be recruiting and the future remains a mystery. I would also have new Navi Icons and Navi Database stuff done by now if it weren't for the lack of EXE6 official art and concept art readily available to me. I might be able to order in an artbook in a month or two, but at this point I might as well wait and see if there's still a team by then. Looks like another year has gone by. Well, the long overdue season finale has finally started. It's a four-parter, and so far we have part one finished. Read it to finally see the introduction of the enigmatic Gamma.exe! More finale content including art of Gamma and the other finale characters is still coming. Alright kids, Here's something new and can be only found right here. I posted an uncut version of Mega Man Ultimate Network Chapter 1. This was the way I intended it to be. Go see it and the Epilouge section, now! Holy crap it's the Apocalypse, I'm actually updating for the first time! Nothing major, just editted an image in my bio with a new mugshot; much more pleasing than the first one too. Be sure to check it out in our bios section, buttons are to your left. And don't worry, the finale is coming along nicely, and ideas for season 2 are slowly underway... well, by me at least. Happy Holidays! Finally some actual content! Drilly completed Chronicle 10 and is now up on the air. The AXE Staff is busy at work with the season finale! IT's going to be a blast so stay tuned! Another small update... I added an emblem I made just recently. Well what do you know, a weekly update! It's not much though, I just putted a side story that I made a while ago. It's a miracle! We've updated! Alright enough with the jokes. I've added a link to my DA account and replaced General Cutman's site with EXE Heroes: Conflict, my EXE Heroes RP Forum. It's highly active, we just achieved 250 post a while ago and I strongly urge you guys to join it. With me now behind the Updating wheel, there no way AXE will hit the dead list. The first part of the tenth Chronicle is now up. It's a long read, hence the long wait, but it's got some nifty action going on in it, so read through it. Another big update goes to the Taiyo Navi Yamatoman series. If you never checked it out before, now is the time to do so. I've gone through every episode and added sprites just like real epilogues. I also made a few changes to Midori's script, but nothing major (I hope). I also replaced my on-site gallery with a link to my Deviant Art account. That saved us about 3MB of space. Stay tuned, because the season of AXE is finally apporaching it's long overdue conclusion! Oh yeah, one more thing. It turns out another year has gone by, so I archived 2005's news posts . So much for this year seeing more updates, it's actually seen less. Well, at least we had a decent stretch of weekly updates for a while. Ooh, ouch. So four and a half months. Yeah. Not much I can do to excuse that, huh? Well, you know, school and everything. But forget it. We obviously have a lot of catching up to do. All we have now is the next two chronicles. I should be able to get some good work done this month though, once finals are done anyway. On an unsettling note, I noticed our account is now 71% full. I seem to remember having a lot more extra space last I left it. So either I haven't been paying attention or FreeWebSpace lowered the capacity for their free accounts some time on the last four months. Another 5MB and we're stopped cold. It's time to upgrade soon. So our one update per week chain got broken. Not only that but we ended up off the Chronicle schedule AGAIN. But no, we're not giving up. In fact I'm going to be trying harder than ever to get things back on track. But check out all the goodies in today's overdue update! Part 8 of the Chronicles is finally up, and to make things a little more interesting I gave titles to the Chronicle index. Check out Nijubu's Break of Dawn: Morning chapter for two more pages as well. There are three more fan-submitted icons on the icon page, all from S6 Iceman, but each is made for one of his friends' own fancharacters. The biggest update is on the Navi Database page, which on top of gaining a section on Battle Network 5 navis, has also received updates on all the other pages, mostly concerning updated moves from EXE4.5 and EXE5. I also added an entry for the infamous Heel Navi. Be sure to check it out! Finally, I put together an archive for our "Inter-Missions" (the shorts at the bottom of this page) so after reading the newest Inter-Mission, check out the old ones by clicking the link below it. That's it for now, see you next week hopefully. It's me, Flash, keeping the ball rolling (and updating). I've uploaded the rest of the souls, and I have, guess what, more artwork. I just dish it out like it was nothing. Today we have Technicolor winds, one of my more abstract works, The Mad Group, which is a compilation of characters, and Techno... Which you'll just have to go see! I'm off to maybe do some eating or something, because I'm hungry. Have a nice week, I'll see ya next update. Two more fan-made icons in the icon section today. Also, tomorrow (or today rather, since I'm practically making this update on Monday) is Johnny's 17th Birthday! Flameman would appreciate it if you do NOT blow out his candles in celebration. For Flame's birthday he got US something in the form of a new epilogue, but I sprited it, and subsequently got him the present of a sprite of Mr.Match in a maid's outfit. So check it out. Today I bring you a pretty big art project we've been working on for almost a year. All the bios except Punk's are now adorned with statsheets representing the navi's customization and style. Features some pretty nice custom artwork of each navi too. Some of the members (namely Serenade, Desertman, Flashman, Flameman, Kingman, Beastman, Plantman, Yamatoman, and myself) constructed their own folders and NaviCust setups so you can get a good look into the actual member's style with these things aside from the info on their character's style. Yep, one week later, here I am. Although truth be told it's not much of an update this time, just finally posting NG#6 which was supposed to be posted earlier this month. At least it's done now. Hey check it! We're getting pretty good at the weekly updating thing! Today we bring you yet more fan-made icons in the icon gallery. There's 13 now, it seems like just yesterday it was stuck at three. I swear I'm not twisting anybody's arm for these. I guess after one person at the Rockman.exe Online forum decided to submit, many more hopped on the bandwagon. Well, keep 'em coming! Anyway, while I was fixing a few URLs and coding glitches here and there, I noticed I still hadn't finished the BN4 navi database page, so I went and did that. If you were itching to see what I was going to write for Junkman's bio, now's your chance. Finally, there's another Chronicle update with #7. NG#6 is still not ready yet, but it's coming along. See you next week for the next update. I did stuff. Yeah, I know it's been a while, it's hard when your motherboard and other components are all on a card table rather in a case. And the grounding, don't forget that. But I'm back and I UPDATED. With, I believe, eleven pictures. All my own. Go check them out, because I worked hard. DO IT NOW! Wow, less than a week this time! Well, it's just a small update tonight. Small in terms of content, but big in terms of news. The icons page has three new additions...not by me! *readers gasp* That's right, fan-submissions! Not only that, but they're made by people that are NOT on the team! *readers collectively faint* I don't know what happened. It's like people suddenly realized there was a spot for them here. Well, I'm certainly grateful, so check out the icons for tha navi creations of Pyo, Slifer, and Megaman7. Here we are again. As promised, episode six of the chronicles is up...but only the AH one, the NG one is still in progress. I probably should have waited until after it was finished to update, but last time I did that I was waiting a whole year. So you get the AH side today and hopefully the NG side soon. Other than that, my art gallery has two new pieces in it, one of Gekkoman, and one Sam. Just a couple of pics I decided to draw for the other members recently. Finally, I've replaced the MHUX affiliate (which is dead) with a DLM affiliate (which is alive). AXE is getting pretty closely tied with DLM lately, so be sure to check out their epilogues and job request RPs for highly entertaining EXE action and the occasional cameo from one of us. TWO weeks?! Damn! That's actually pretty good for us. Now what did I tell you? The Chronices are BACK! These next two are both by me. As a bonus, check out the side stories for an offbeat epilogue by Flameman. Stay tuned, because there'll be another update in another two weeks featuring the next two chronicles. No new Inter-Mission today, two weeks isn't enough time for it to sink in. New Inter-Mission next time, promise. Here we are in the futuristic year 2005. In honour of our just-over-one-year anniversary, I have archived the news. Yes, a whole year's worth of updates is worth one page in the archives. Hopefully this year will be different. We have some real updates for you today. We finally have a fan art section with two whole pieces of fan art! Check the Epilogues section for another installment of Break of Dawn, another installment of Taiyo Navi Yamatoman, and the first instalment of Kingman's crossover epic with his bizarro Darklight counterpart. Just below this update, you can also read an "Inter-Mission" a little bit of funny to amuse you in case you don't care to browse this site any further than the main page. This is the first of many. So far they're all written by Nijubu, but there'll eventually be some by other team members too. I'll worry about making an archive page for them later. After so much time nobody's even looking for help with the game any more, I've finally posted the final (but not last) chapter of the BN3 Walkthrough. Check out the Golden Alpha recolour I made just for the special occasion. Oooh, shiny. Maybe one of these days we'll post a long-overdue chronicle too. Until then, there's still something for your reading pleasure, the second part of Nijubu's Chronicles! Nij's chronicles are more interesting than the rest of the team's chronicles put together anyway. Read and enjoy. It's Thanksgiving Holiday in Canada, so I had time to update again. Like I said last time, new icons were indeed on the way, Colonel, Gyroman, Tomahawkman, and even Duo, all have new icons thanks to the new EXE anime which has shown them. The Stories page has gotten a big update with the addition of TWO new TNYs, FOUR parts of a story by Plantman, and ONE new mini-epic by Nijubu. Also check out Johnny's art gallery for some very nice sprites and comics. Finally, we have a new affiliate in Cutman.exe's Hideout. Until next time then. I just updated my art gallery with some pics of the NPCs in the chronicles. I also recently made a new icon for Medi, one of the new navis in EXE5. That's right, EXE5 is on its way, and so are a crapload of new icons for me to make. Happy Labour Day. If you have nothing better to do today, you just might be reading this page. Good! Anyway, the Bios section has undergone an incomplete overhaul...it would be complete except I still need input from some team members. On top of reformatting them and making them more compact, I also added a couple new bio pages for other characters and old team members, check out those pages for some new sprites I made too. There are also new icons on the icon page that were made for Sam's Boss Guide. You know the drill! Enjoy! The King has graced us with his royal presence! That's right, Blackbelt finally submitted some content. For now, there's a Boss battle guide in the walkthrough section, which is now linked from this page. He's also done some writing and folder building that we'll get up later. In the interest of settling back into the old server, I've updated my icons section with all the ones I made since the move. Also, by popular demand, I added the manga's account of what Bass's icon looked like before it was slashed (Gauntlet suggested it, and he's pretty popular, I guess that qualifies as popular demand). Also re-updated are the Epilogue and Navi Database pages. I come to you in this update with good news, and bad news. I won't give you a choice of which to hear first. The bad news is that I will be leaving for this week to cleveland, and then to niagra falls (this will be the second time these past two months being there), and the vacation will take up what's left of summer vacation. After that, I have school. First I have to go to the high school for a math course during their first hour, then I get to go around for still a full day at the junior high without a study hall course or anything. So don't expect to see me on often, if at all, in the first half of the school year. Which makes (at least) two usually somewhat active team members MIA. The good news is that I've got a real update for you. Y'know, content and the works. I managed to finish updating all the art galleries to include thumbnails. That and I've added one of the pieces of art Rai had lying around on the server and a bunch of stuff I just recently got to putting on. So check those out. And while we're on the topic of checking stuff out, check out the forum and the guestbook. Heck, why not? If you're still actually reading this you probably have time to spare anyways. But now I must go, for it is 4:30 A.M. here, and I have to get up at 7:30 (now THAT'S what I call dedication... or putting it off until the last moment...). Anyways, try not to party too hard while I'm gone. Well, the "new" server died, and has been dead, so now we decided to go back to the freewebspace server. After all, it's not like we did a lo-- I mean, it was grueling! Copying and pasting urls, and uploading stuff. Anyway, I also added a gallery for Johnny's artwork, and I'm trying to add thumbnails to all the art galleries. Expect that, some more art from some of the members (including myself), a new off-topic epilogue from myself, and better formatted bios soon. But probably not a new server. Yeah. Well, looks like the new site is up and running and up to date. I suggest you all set your bookmarks to http://axe.radicalentity.com This site won't get any more updates...unless we have to come back here for some reason, but I'm just being pessimistic. The new site is really, really, really good. I hope we keep it forever. Now I'm being optimistic. It looks like me may actually get this new server working after all. Until then, here's a little update anyway. One icon added to the icon page, and Midori's biggest story yet, Union of Two Spears, is finally completed and ready for your reading pleasure. We're gonna have to get him his own section on the fiction page eventually. So you're probably wondering why we're hardly updating now. Well, you probably just assumed we're lazy, and to an extent you're right. But as usual we've been doing our work behind the scenes and it's time to come clean on what we were working on. See, Cifnas had us hooked up with a nice new server owned by his friend that we could use and be rid of the popups and ads and give the site some other nice upgrades. A few weeks ago the new site was finally complete but it was riddled with bugs, and we're not exactly in the position to be debugging. See, this guy that was to be hosting us refused to give any of us ftp access, apparently we would have to send all our content through him. Obviously, that's a big stinking pile of BS. Who ever heard of a team site being managed entirely by a guy that's not even on the team? Since the new site got up this guy hasn't been any help in the debugging department either, so basically the whole project was a waste of time. So it's time to say hello once again to updates on the old crappy server! Today we've got a bunch of stuff that's been on the "to do" list for months. Check the Eps section for two more of Yamatoman's side-stories and an update to Sixty Seconds With Beastman. Check the Art section for the new gallery featuring Darklady's works, as well as some additions to my gallery. Finally, the Links page now has a link to Darklady's art gallery. Expect some more updates soon. I mean it this time. Well, apparently somebody out there loves us. Over 2,000 hits! Yay! We haven't updated in over a month, but whatever. And hey, while you're waiting excitedly for our next actual update, why not stop by the Forum sometime? Aside from the team's private little section, there's not much going on around there right now, but go! Start some threads, introduce yourself, roleplay, bake some cookies. We like cookies. But no raisins. I don't like raisins. Hey, it's me again, the guy who hasn't done much of anything for this sit until now. I updated the bio for Darklady. Yippy. Okay, going away now. Bit of an update, but mostly announcement. Vidal has quit, making him the first and hopefully only member to quit since we started the actual site. He has been quickly replaced by KindleWoman/RajalTikana as Darklady.exe. To fascilitate the change, the chronicles have been edited to replace Vidal and Darkman with Adrienne and Darklady. I know that's not a very accurate look at the last few months when she wasn't even here, but we have a thing about keeping the characters in that particular storyline constant...even if it means changing them, if that makes any sense. Anywho, more updates are coming as she moves on in. We also have regular stuff ready for upadate, but we've been holding off for a certain reason, you'll see in hopefully a week. Until then, I've made a small update to the icons section. Yeah, I added an affiliates box, with our two affiliates. I didn't actually plan to put it up now... as I have *gets hit* Okay, enough on that subject. Let's just say I have a special surprise in the near future. Anyway, click the links, and support the people who are supporting us. that's it for this update... keep visiting though, and soon I'll unviel my MASTER PLAN TO TAKE OVER THE WORLD! Wait, actually no. Nothing like that. Well anway, peace out. All done. Check out the Epilogues section for two new Chronicles by yours truly. That's the end of our checklist for now. Tune in next week (or month) for the next update. See? That was quick. I have a lot of free time on my hands this week. First, there are some Art section updates. We got a few new pics from Beastman and a Sprite Sheet from Yamatoman. Second, if you want to know what the operators of AXE look like, check out the bios, where sprites of all the characters have been added. Third is the Epilogues section; three new sidestories have been added: "Moonlight of a Hellish Past" by Yamato, "AH vs. NG" by Beastman, and "60 Seconds with Beastman" by Beastman. On top of that, there's still another chronicle coming in the next day or two, depending on when I finish writing the thing. It's Raijin, making my first update. I did some fixing with some images around the site and updated the icons and walkthrough sections. The icons section has four new BN4 symbols and one original. The Libraries section of the walkthrough finally has the Giga Chips and PA libraries up. They've been done for weeks. There's more updating on the way, so stay tuned. Mr. Disembodied Head of Sand here to wish everyone in the Community and beyond a very Happy New Year! And crap. Hey, don't blame me for this pointless update, I'm bored and alone on New Year's. Sympathy for the angel, anyone? No? Well, I did thoroughly proofread the first Acid Hackers' epilogue, and fixed a few minor things concerning my bio and writings. Yeah. I'm going dance some more now. I thought I'd do some work for the team between math, eating, and sleeping. I should be sleeping, but I feel asleep at my math. So now I'm awake, and I removed some of the double banner errors, and fixed the forum links that Havoc missed. I also changed some of the descriptions for my art. I've gotta thank Havoc and Rai for helping out on the site, I owe them one. I've got to go, I've got an idea to confirm for the next update.P.S. : Whoah, it's new years eve, isn't it. Hah. Well, now that the christmas season is over, we have a huge update here. I added Gemini's Art Gallery, Beastman's Art Gallery, RaijinK's Navi Icons, Gemini's Navi Souls, a links page, and a Link to Gauntlet's Guide to Megaman Teams, which is a must see if you want to start one. I also Added a section to My New Navi Database, which is located in the Others section. Plus, a new section of the guide is up. The Chips Section was extensively made and researched by RaijinK, so go check it out. Well, until the next time we meet. New Site is done! Check out the Art section for art from the team members, such as some drawings and some of my Navi souls. Don't forget to check out the brief profiles of the team members in the Bios section, also. And remember to stop by the Epilogues section to read our Prologue, it might help you get a better understanding of our team. And last but not least, don't forget to stop by the forum!